This site is for the use of Christian churches' activities, delivering many kinds of Christian relating stuff like animations, illustrations, toons and games. In this project, we have been trying to make a useful cartoon style illustration library covering all the major events/stories in the Bible since 2006. We have got great number of feedback about this site from all over the world, and the site is supported by these church's pastors' prayer. This is MMBOX's life time project and will keep going as long as the Lord allows us. MMBOX is always welcoming the request for this projects. 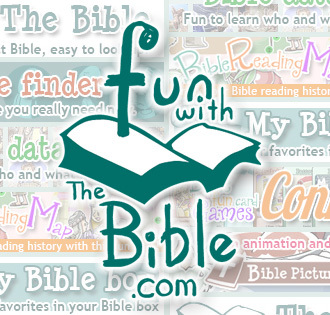 Read and learn about the Bible with fun!! 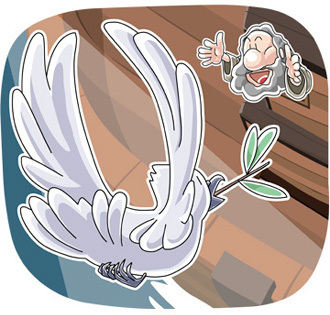 This site is a tool to help you read the Bible with some fun, especially for kids. Featuring 'Verse Finder' to find verses for many situations and by key words, 'Bible data base' is a concise database to get the basic ideas of characters and events in the Bible. You can record your Bible reading record with fun on 'The Bible Reading Map'. You can play 'Bible cards' to have fun and learn about the Bible at the same time. Kids never get bored with our 3 min short devotion animation! It's not only for kids but also adults could have a lot of fun with it! For your daily jogging log! This is the web application for recording your daily jogging / running exercise. You can design your own jog / run routes with Google Map, and save them in your own library. The training data will be stored in the data base for showing you various statistics like distance / duration bar graphs, weight history line chart, powerful search function, training data RSS feeder, shoes library and many more! You can even save the training data in CSV format for your own use of the data. 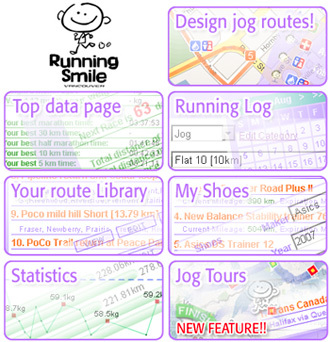 MMBOX has made a actual running club in Vancouver since 2002, naming this club same as this site 'Running Smile'. MMBOX PRODUCTION has been producing web contents, illustrations and providing web support for clients worldwide since 1999. We would like to show you what we have done, however these are just a limited numbers of samples we can show here. Select the year and click on the project name to see its info. This is 39th Flash CM project from Infonear. A short animation promoting Deodorant 'Men's Deo 7200'. This is 38th Flash CM project from Infonear. A short animation promoting a Hair clinic 'Reve-21'. This is 37th Flash CM project from Infonear. A short animation promoting a Hair treatment 'The scalp 5.0C'. This is 36th Flash CM project from Infonear. A short animation promoting a Skin care product 'Shellwomb'. This is 35th Flash CM project from Infonear. A short animation promoting a Lactic acid supplement. Character design for Goryeo information center. This is 34th Flash CM project from Infonear. A short animation promoting a fish supplement 'Miyabino DHA'. This is 33rd Flash CM project from Infonear. A short animation promoting a laundry service 'Linet'. This is 31st Flash CM project from Infonear(previously ChanceIt). A short animation promoting a hair-lose prevention shampoo UMA shampoo. This is 32nd Flash CM project from Infonear. A short animation promoting a supplement 'Kinari'. This is 30th Flash CM project from ChanceIt. A short animation promoting a supplement 'Kainyu EX'. This is 29th Flash CM project from ChanceIt. A short animation promoting a face washing soap Fuwarikka. Instruction poster for residents in mansions by maintenance company Advance. Logo design for Kojima ltd. This is 28th Flash CM project from ChanceIt. A short animation promoting a dietary tea. This is 12th Flash CM project from ChanceIt. A short animation promoting a blueberry supplement. This is 26th Flash CM project from ChanceIt. A short animation promoting a Nikkei personal computer magazine. This is 24th Flash CM project from ChanceIt. A short animation promoting Black bean extract supplement . This is 25th Flash CM project from ChanceIt. A short animation promoting a Natural water server 'Frecious'. 2nd project for Frecious. This is 22nd Flash CM project from ChanceIt. A short animation promoting a supplement for backache. This is 23rd Flash CM project from ChanceIt. A short animation promoting Nata beans tooth paste. This is 21st Flash CM project from ChanceIt. A short animation promoting an eye health supplement 'Crocetin Super eye'. This is 11th Flash CM project from ChanceIt. A short animation promoting a breath care green tea supplement 'Aroma of tea'. This is 18th Flash CM project from ChanceIt. A short animation promoting a diet supplement 'Hot African mango'. This is 16th Flash CM project from ChanceIt. A short animation promoting a service called 'Flets' from a internet provider company DTI. This is 14th Flash CM project from ChanceIt. A short animation promoting a medicine for forgetting things. This is 13th Flash CM project from ChanceIt. A short animation promoting Garlic balls which is good for boosting your health. This is 12th Flash CM project from ChanceIt. A short animation promoting a fresh breath supplement Egao's Shoshu-tsubu. This is the 2nd book of the following 'The ABSs Of Matthew for Kids' by Jim and Vicki Coy in 2009. It's all color 40 pages including more than 30 clips of MMBOX's drawings. My name and also the url of ChristianClipArts.net are on the credit too!! This is 11th Flash CM project from ChanceIt. A short animation promoting a healthy tablet N-Acetylglucosamine. This is 10th Flash CM project from ChanceIt. A short animation promoting a eye care food Boysenberry. This is the site for the one of oldest Japanese travel agency in Vancouver, Kent Travel's web site. This is 9th Flash CM project from ChanceIt. A short animation promoting a cosmetic device Estenad Sonic. This is 8th Flash CM project from ChanceIt. A short animation promoting a insurance consulting network company. JT Special campaign 2009 "JT Thunders & Marvelous memory game"
JT's annual winter present canpaign. This is the 3nd consecutive years for MMBOX to make these games for them. This is a memory game of JT Thunders and Marvelous. JT Present campaign "Which snowman has JT drink?" JT's annual winter present canpaign. This is the 3rd consecutive years for MMBOX to make these games for them. This is the game just like "Guess Who?" This is 7th Flash CM project from ChanceIt. A short animation promoting a healthy fiber drink. 2nd project of JT's summer campaign. Selecting the ingredients by guessing from the name and photo of a dish. This is 6th Flash CM project from ChanceIt. A short animation promoting the herbal tea which is effective on constipation and diet. We proudly made the summer campaign game for them consecutive years. A memory game remembering the drinks of the family members want. 5th Flash CM for ChanceIt, and 2nd product for LION. Short animation for the product which improves the eye sight of senior people. This is 4th animation project for ChanceIt, 2nd for the same product. Appealing the product to metabolic syndrome people with up tempo simple fun short animation. JT Present campaign "Brain training challenge"
JT's annual winter present canpaign. This is the 2nd consecutive years for MMBOX to make these games for them. We made not only games but also made a lot of brain training quiz too! This is the 3rd Flash CM animation for ChanceIt, and 2nd for the same product. Appealing the products with up tempo simple story, but some drama style composition. So it became fun short animation. MMBOX made 2 games for JT in the summer 2008 for the present campaign. This is the 2nd animation project from ChanceIt. I focused to appeal the products in simple and concise way with good tempo. Japan Foundation, China center, Table tennis game, Heros' table tennis. A kiosk software which display ships location on the map reading frequently updated XML file. This project is from Kuni Design studio in Vancouver and Kuni design did the disign part. JT Present campaign "Let's make a snowman"
User memorize the snowman which was made with many various materials, then user start to make the same snowman from the scratch. Weather monitoring system "Rose System"
We produced an animation for Kanazawa Univ TLO. This is a part of their project developping a device which prevent car/traffic accidents. It's such an honor to help this kind of project as an animatior. We made 2 family games for JT summer special campaign in 2007. Jigsaw pazzle game and finding errors game. Since 2006, MMBOX is making games for JT. This was the game for campaign of newly released tea drink from Kirin in March 2005. Vancouver based bilingual Chemistry site chemistryquestion.com. MMBOX is drawing illustrations every month. Please click "Gallery" to view all the illustrations. This was a campaign at Rakuten (formarly Ynot) site in Christmas 2003. There were 4 Santa Claus with different colors, like Power Rangers. Each Santa presents unique presents to viewer. Panasonic's newest cel phone with 2 cameras in 2003. We produced 3 series of short animations for Panasonic's main promotion site. This clip is for the new touch panel guide "Puls-e" available at restaurants "Gusto" in Japan. Introducing newly released cinemas. It was a big flash animation kiosk introducing more than 40 courses by each unique character with voice over for Kogakuin, which is one of the biggest collage in Japan. Sales promotion animation to introducing trip packages by Jenny-look character.